Whenever there’s something you want to ask us or you get stuck using Messente – just click on the orange window in the bottom right corner of the screen. Drop us your question and someone from our team will instantly see what you typed in and will assist you. Recent studies (like the US Wireless Customer Care Study for example) claim that over 40% of US based customers use live chat windows as a primary support channel online. It’s just so much faster than e-mail and more convenient than a phone based support line. Studies aside – we’re simply glad to be able to talk to you. 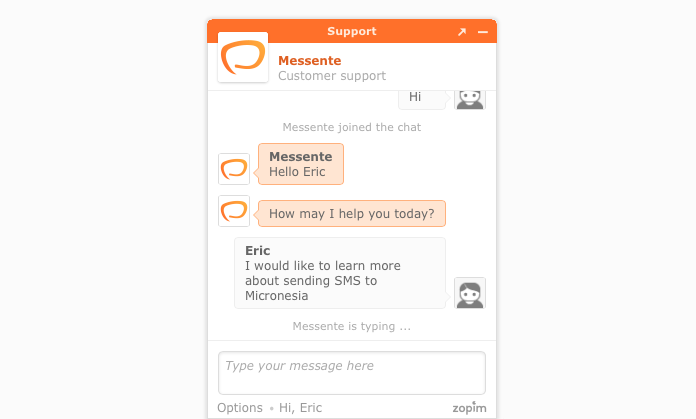 Thanks to everyone who has already used our chat window to give us valuable feedback on Messente.